Liatroim – Best of luck to our Management and Team as they head for Celtic Park on Saturday to play Derry – good luck to our Clubmen Sean and Conor. Scór – Comhghairdeas to our Ballad Group – Brendan, Sile, Cait, Cormac and Shane on being crowned Connacht Champions on Sunday last and now head to the All Ireland Final in Castlebar in April – well done and good luck for the final. Well done also to Sinead who took part in Solo Singing and our Rince Seit who also represented our Club and County. Membership – Membership is now due rates for the year as follows – €40 Non Player, €60 Player, €60 Family, €50 Student Player, €20 Juvenile up to 17 – our Registrars for the year are Jerome McWeeney and Keelan Mulvanerty. A Date for your Diary – The Yellow River Drama Players are rehearsing for their big production A Wake in the West – they will take to the stage in our Community Centre on 22nd, 23rd and 24th of March – this is a hilarious three act comedy so don’t miss it. Liatroim – Páirc an Chrócaigh here we come – what a National League Campaign Leitrim have had so far in 2019 and its not over yet – to be sitting on top of Division 4 with Derry and contesting the Division 4 final on March 30th and now heading for Division 3 – Comhghairdeas to all of the panel of players and management on their great success – special congratulations to our own 2 Club men Sean McWeeney and Conor Cullen – of course before we head to Pairc an Chrocaigh we have to play Derry away on bank holiday weekend Saturday March 16th – anyone wishing to travel to Derry and wish to book a seat on the bus Jerome McWeeney is your man 087 637 0051 – Jerome will also sell you a Supporters Ticket if you wish to purchase one. Lotto – Next Lotto Draw Sunday night March 10th in Mac Fheargails – Jackpot €2,300 so get your ticeidi. St Brigids – Mixed fortunes for their teams over the weekend U 13s had a good win over Annaduff but U 17s were beaten by Fenagh. Date for your Diary – The Yellow River Drama Players are rehearsing for their big production A Wake in the West – they will take to the stage in our Community Centre on 22nd, 23rd and 24th of March – this is a hilarious three act comedy so don’t miss it. Lotto – Results from our last Lotto Draw – Nos drawn 2, 9, 22, 26 – no Jackpot winner – House €25 Keelan Mulvanerty, Sponsored Adrian Cullen – €25 – Paddy McGourty, Debra Keaney, Philip Roddy, Pat McTeague, Mickey Flanagan, Kathleen Maxwell. Next Draw Sunday next February 24th in Poor Scholar – Jackpot €2,225 so get your tickets. Leitrim v Limerick – Best of luck to Leitrim Team and Management as they head for Kilmallock on Saturday next to play Limerick in the 4th round of the League. Leitrim are in a great position going into this game after winning their 3 games so – good luck to Sean and Connor on Saturday. Supporters Club – Anyone wishing to purchase a Supporters Club Ticket can do so from Jerome McWeeney at 087 637 0051. Comhbhron – Deepest sympathy to Robbie, Sean, Andrew, Robbie, Seamus, Marie, Geraldine and their families on the death of their beloved Eileen may she rest in peace. Deepest Sympathy to Caroline Sammon on the death of her Aunt Patty Rourke. Leitrim Win – Comhghairdeas to Liatroim on their great win over Wexford on Sunday – well done to our own Club Man Sean McWeeney and best of luck as you travel to Wicklow on Sunday. Awards Night – Again Comhghairdeas to Seamus Prior on receiving the Hall of Fame Award on Friday night last – a great honour for Seamus and his family – a great night was had by all and great to see such a big crowd there from Aughnasheelin. Membership – Membership is now due rates for the year as follows – €40 Non-Player, €60 Player, €60 Family, €50 Student Player, €20 Juvenile up to 17 – our Registrars for the year are Jerome McWeeney and Keelan Mulvanerty. Operation Transformation – Achadh ná Síleann Lights up 2019 – we are part of the Operation Transformation and GAA’s Ireland Lights Up Programme which runs until February 21st which is for 6 weeks – it takes place on Thursday evenings from 7 – 8 pm – you can walk, jog, run or just stroll. Great to see a good crowd there on Thursday night last but would love to see many more there this Thursday and for the next few weeks. Scor Sinsir – Scor Sinsir is taking place on February 9th – anyone interested in taking part please contact Sheila Murray. Yellow River Drama Group – Our Drama Group are busy rehearsing for their upcoming production in March – they are currently running a fundraiser – a Valentines Draw lines are currently on sale and the draw will take place on Saturday February 9th in Super Valu in Ballinamore – lovely Hampers to be won. Good wishes – Congratulations to Pat Gilhooly on his selection to contest the Local Elections in May – best of luck Pat and Mary. Lotto – Results from Draw held January 13th – Nos Drawn 2, 10, 25, 27 – no Jackpot Winner – €25 House Draw Brendan Meehan, Sponsored P.J. Fox, €25 Marie/Eanna Finn, J. Coen, Paddy McGourty, Ciaran Hearty, Mickey Brady, Cillian McWeeney. Next Draw Sunday January 27th in Shortts – Jackpot €2,075 so make sure to get your tickets. New Baby – Comhghairdeas to Louise and Michael Domican on the birth of their baby girl Aine , a sister to Tadhg. Comhbhrón – Deepest sympathy to the Flynn Family – JJ, Frankie, Joe, Cathal, Brendan, Gretta, Christina, Carmel, Joan and their famililes on the death of their mother Aileen – may she rest in peace. Co Board |Awards Night – Friday night January 25th all roads lead to the Bush Hotel for the Annual Awards night – this year the Hall of Fame Award is heading to Achadh ná Síleann – to Seamus Prior – Comhghairdeas Seamus, Teresa and family – hope you all enjoy the celebrations and look forward to seeing you all on the night. Achadh ná Síleann Lights up 2019 – we are part of the Operation Transformation and GAA’s Ireland Lights Up Programme which runs until February 21st which is for 6 weeks – it takes place on Thursday evenings from 7 – 8 pm – you can walk, jog , run or just stroll. Great to see a good crowd there on Thursday night last but would love to see many more there this Thursday and for the next few weeks. Christmas Lotto Results – Firstly Comhghairdeas to Derek and Seánaí Moran who won our Jackpot of €6,725 just in time for Christmas, then shortly after Christmas Mary and Derek, welcomed a new baby daughter, a sister to Seánaí and Cáit – congratulations to all and enjoy your good fortune. Other winners in Lotto Draw – House Draw €Damien Flynn, Butlers Hamper Emma Bohan, Sasta Voucher Sean and Nora Early, Voucher Brendan Meehan, Bottle Paddy McManus – Annual Draw Megan McGirl – Lotto Nos 3, 11, 19, 22 – €100 Francis Murphy, 100 Martin O’D, €50 Sean McWeeney, Bottle John Creamer, Annual Ticket Margaret Murray, Bottle Nicole Costello. Congratulations to all Winners. Our Lotto back on Sunday night next January 13th in The Commercial with a new Jackpot of €2,000 so get your tickets – Annual tickets available for €50. 1918 Leitrim Senior Champions – On Sunday eve December 30th we celebrated the winning of the Senior 1918 Championship. We were honoured to have Monsignor Liam Kelly to give us a very interesting talk and look back to the 1918s and the happenings of that era, it was great to see such a big turn out of young and old – well done to the organising Committee of Barry McWeeney who acted as MC on the evening, Shirley Sammon, Peter Flynn and Stefan Hoare a lot of research was done and there were plenty of interesting articles available on the evening – On behalf of our Club I would like to congratulate Monsignor Liam on being appointed Diocesan Administrator on the announcement of the retirement of Bishop Leo O’Reilly – thank you to all who baked the lovely goodies and to all involved. Well done – a lovely social evening in our Community Centre. We also had the presentation of Player of the Year Awards – Young Player Ciaran Cullen and Senior Player Barry McWeeney who were presented with their Awards by Club Chairperson Brendan Reynolds Comhghairdeas Ciaran and Barry. We had lots of great entertainment from the Reynolds Family, our Senior Scor Ballad Group who represented their Club, County and Province in the All Ireland Scor in 2018, our young Set Dancers and Novelty Act who represent out Club and County at Connacht Scor on Sunday next – good luck to all involved. Marriage – Comhghairdeas to Deborah Gilheaney and Philip McGourty who were married in Aughnasheelin on December 28th they have now returned to reside in Australia – best of luck for your future. Comhghairdeas to Sean McWeeney who lined out with Leitrim on Sunday last against Mayo also Conor Cullen who was on the panel – this game went all the way to the wire with a draw at fulltime and made history by going to penalties which Mayo were winners. Operation Transformation walk is on Thursday, January 17th at 7 pm at our pitch – more information next week. Full range of classes will start in Ballinamore Library on Tuesday, 8 January 2019 at 8.00pm. There are separate groups for relative beginners, for those who have some Irish and for those who are fluent. These classes are a great opportunity to practice the Irish you know and to improve it. Also, Leaving Cert or transitional year students will find it useful for practice for their Irish orals. Classes are free of charge and will run for 10 weeks to mid March. Starting next Tuesday at 8.00 in Ballinamore Library. Seo seans chun an Ghaeilge a labhairt. Beidh fáilte romhat. Christmas Lotto – Our big Lotto Draw taking place on Sunday December 23rd in An Bhanc with loads of prizes so make sure and have your ticket in the Drum. Lotto Results Draw December 16th – Nos Drawn 2, 11, 16, 19 – House Draw €25 Declan McCarthy, €25 Philip Roddy, Kerrie Meehan, Anthony O’Donnell, Carmel, Creamer, Gavin Sammon, Darren Flynn c/o Gerry Gilheaney. 1918 Leitrim Senior Champions – On December 30th we will commemorate the 1918 Leitrim Senior Champions with an event in the community centre, events kick off at 6pm. Fr Liam Kelly will present a piece on life in the parish, county and country at the time. He will also unveil the members of the infamous team and those who managed the team to our only senior success to date. Some very important memorabilia from the time will also be on display in what promises to be very interesting event. Also on the night, we will have the announcement of the Senior and Young players of the year and some of our scor participants will provide some entertainment. To close out the day a video of the 1988 league final will be shown in the ‘The Bank’ in Ballinamore. Everyone welcome. Christmas and New Year – Greetings to all our Readers at home and abroad and wishing you all a Happy and Peaceful New Year and also to all in the Sports Department good wishes for a Happy and Prosperous New Year. AGM will take place this Friday night December 14th at 8 30 pm in our Club Rooms make sure you come along. Lotto Results – Nos drawn 1, 16, 20, 21 – House Draw €25 Jerome McWeeney, Sponsored Noel Sweeney – €25 Philip McHugh, Noel Cafferty, Gavin McWeeney, Sharon Flynn, Keelan Mulvanerty, Frank Flynn. Next Draw Sunday Night December 16th in Priors – Jackpot €6,650 so get your ticeidi. 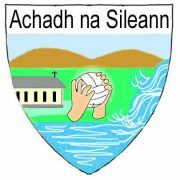 1918 Leitrim Senior Champions Commemoration – On Sunday December 30th we are holding an event in the Community Centre to acknowledge the Aughnasheelin Team that won the Senior Football Championship. Events will kick off at 6pm, a full itinerary of events will be published closer to the event. Detail from the time is proving hard to come by so if anyone has any information from the time or would like to assist in preparation please get in contact with Barry McWeeney 086-3610690. Club Player of the year Awards will also be given out on the evening and we hope that it will be a great event to finish off 2018 and welcome a new year for Aughnasheelin. Wednesdays Social Dancing with Rina Bannon continues in the Community Centre from 8 to 10 pm – Jiving, Waltzing, Fox Trot, Quick Step etc. Fridays 7 to 8pm – Activity Night – The Lights are on – Lets Walk, Jog or Run at Aughnasheelin GAA Walking Track – Everyone welcome young and old. Scor – Comhghairdeas to all our young people who represented our Club at Scor na nOg in Drumshanbo – well done to our Novely Act Team who won the County Title and now head to Connacht in early January – well done and best of luck. Thanks to all who helped out. Well done to Sarah McWeeney who was Bean an Tí at Scor a nOg. AGM will take place on Sunday December 9th at 3pm in our Club Rooms make sure you come along. Wednesday’s Social Dancing – with Rina Bannon continues in the Community Centre from 8 to 10 pm – Jiving, Waltzing, Fox Trot, Quick Step etc.